Planning smooth trajectories is important for the safe, efficient and comfortable operation of mobile robots, such as wheeled robots moving in crowded environments or cars moving at high speed. 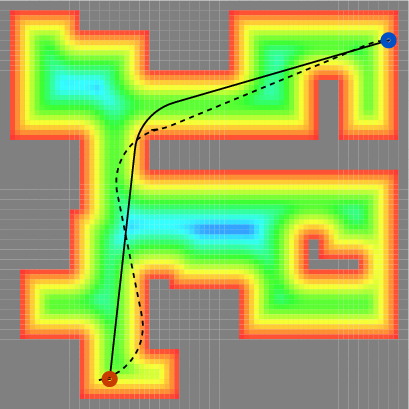 Asymptotically optimal sampling-based motion planners can be used to generate such trajectories. However, to achieve the necessary efficiency for the realtime operation of robots, one often uses their initial feasible trajectories or the trajectories of non-optimal motion planners instead, typically after a post-smoothing step. We propose a gradient-informed post-smoothing algorithm, called GRIPS, that deforms given trajectories by locally optimizing the placement of vertices while satisfying the system’s kinodynamic constraints. We show experimentally that GRIPS typically produces trajectories of significantly smaller length and higher smoothness than several existing post-smoothing algorithms.